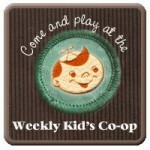 The ABCs of Buggy & Buddy … and this week’s Kids Co-Op linky! After a short break, my weekly ABCs feature series is back! Can you believe that this is the FIFTIETH (5-0!) ABCs feature! If you are a new follower or if you haven’t checked out the series before click here to see the others! This week I’m excited to feature the ABCs of Chelsey blogger behind Buggy and Buddy. The blog is easy to navigate and is filled with beautiful photos and terrific ideas as Chelsey shares the fun she has with her 2 kids (almost 5 yrs & 20 months). Make sure to check out her post on creative ways to invite birds to your home. favorite Zoo animal gorilla~ I could sit and watch them all day!